Well we made it to June and the heat appears to have arrived with it. High 90’s the end of the week and a whole week in the 90’s? Why is it we can never just gently go thru the 80’s for a while and then into the brutal temperatures? Oh well it makes the blueberries and the tomatoes ripen faster. After last season without blueberries because of the record Easter freeze and the madness that it is trying to keep them picked we are now in the middle of it. 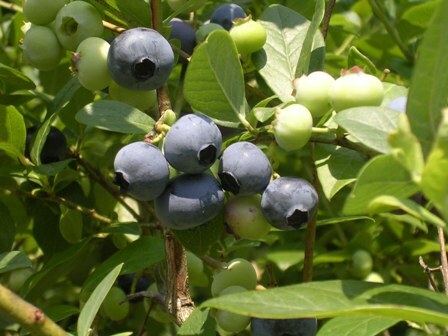 This week or next is going to be the peak of our blueberry crop, with next Monday probably the peak day due to the high temperatures. Blueberry picking is the only time we hire extra help on the farm. The whole operation is designed to run with a steady flow of human energy, just the two of us and two more part timers. But there is an atmosphere that develops around blueberry season as new faces come to pick and join in our now established social structure. For nearly 3 months it has just been the four of us doing the dance of employee-employer, student-teacher, worker-supervisor, advisor, helper, friends. We now know each others routine, style, jokes and now there are new opinions, ideas, senses of humor. 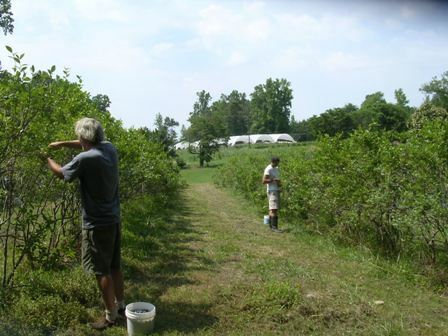 Blueberry picking is maybe the best job on the farm, unless you hate tedious tasks, but with the new faces and discussions in the field it seems to go quickly. It doesn’t hurt that it’s a beautiful setting on the hill, almost always with a slight breeze and the birds calling nonstop. Everyday you end up on the otherside of the row from someone new with new stories and questions. Other farmer friends of mine say I should hire migrant workers to pick, it would save money. It might and we used to hire some local Latinos when we were in the wholesale blackberry business and they are amazing workers. I have come to appreciate the other benefits of having these new faces on the farm, it gives us a boost, it gives the staff a break from working only with each other, it exposes these new people to farm work without some of the grittiness of it. It is this social side of a sustainable farm that really makes it work, not just the crops and the tractors. Soon enough it will be back to just the four of us, avoiding the heat, picking tomatoes and peppers and flowers, telling the same old jokes.